I love spices. I could spend hours browsing the aisles at my local spice shop and have enough jars in my own kitchen to prove it. Everything from chili and curry powders to truffle salt and Szechuan peppercorns — you name it, chances are I have it. But one of my favorites in that drawer is cardamom — an Indian spice that’s ground from the seeds found in cardamom pods. It’s the perfect blend of sweet, savory, spicy and smoky and it works well in all kinds of dishes. I actually remember the first time I had it. I was at Semiramis, my favorite Lebanese restaurant located in Chicago’s Albany Park neighborhood (actually, Semiramis is one of my favorite restaurants in Chicago, period). One of the must-order offerings on their menu is the Arabic coffee, a strong coffee made with raw (not roasted) coffee beans and spiced with cardamom. To make it, ground raw coffee beans and cardamom are boiled in hot water for three minutes, steeped for five, and then poured directly into small cups for drinking. It’s not run through a coffee filter or pressed like a French press, so Arabic coffee tends to be a bit thicker as the grounds don’t get completely separated from the coffee before drinking. My husband and I love it. I’ve since begun using cardamom at home more frequently and I’ve found that it works particularly well in granola. This recipe, which is a bit on the savory side, is my current favorite — oats, nuts and dried fruits coated with olive and flax oil and dusted with cardamom. It’s the perfect breakfast. Preheat oven to 300 degrees. In a large bowl, combine all ingredients (with the exception of the apricots, cranberries and yogurt). Spread on a rimmed baking sheet in an even layer and bake for 40 minutes, stirring once or twice, until well toasted. 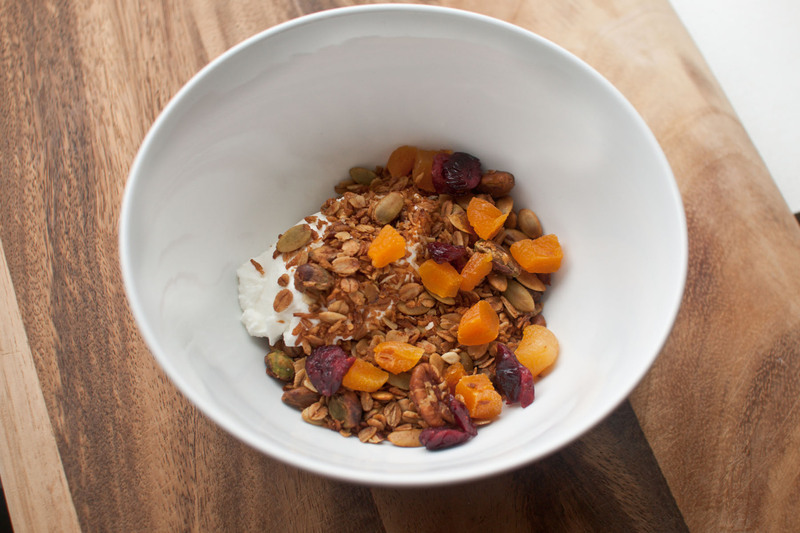 Transfer granola to a large bowl and stir in apricots and cranberries. Serve with Greek yogurt. Savory granola! This sounds so awesome! Cardamom are always good with pistachios. I’d love this for breakfast, granola and yogurt is such a good combination. This sounds lovely. I love caradmom & Lebanese food as well. I think I will make this when I get home. I like that it’s less sweet than most granolas are. I finally assembled the ingredients and made the granola. The only problem is I can’t wait till morning to eat it. My wife couldn’t locate pistachios so I substituted with raw cashews. Yum.